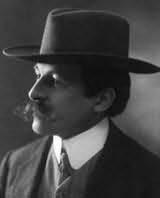 Maurice LeBlanc became famous for the creation of Arsene Lupin, a gentleman thief and master of disguise. LeBlanc was born to a wealthy family, studied law, worked as a police reporter for a time, then found his career as a fiction writer. His first Lupin novel was hugely popular and set the pattern for his career. While LeBlanc wrote much other fiction, it was the Lupin series which made him internationally famous, the French equivalent of Sir Arthur Conan Doyle.